This is great treat for Valentine's Day! BAKERSFIELD, Calif. — Happy Valentine's Day everyone! 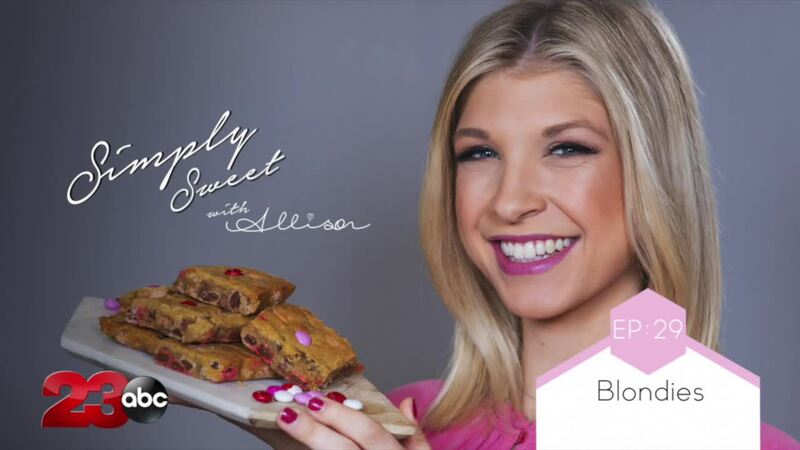 This week on Simply Sweet Allison, we are making blondies with pink and red chocolate candies. These gooey and buttery bars are the perfect one-bowl, sweet treat to make for your valentine this year! Enjoy, these will definitely go fast! Combine brown sugar and melted butter until there are no lumps. Add in the egg, vanilla extract and salt. Mix until well combined. Pour in the flour and stir until a light brown color is achieved. Add in the chocolate chips and M&M's. Pour the mixture into a 8x8" baking tray lined with aluminum foil. Bake for 20 to 25 minutes until the top has a thin layer and the middle is still gooey. Enjoy with a loved one this Valentine's Day!